You can visit some or all of the orchards by following the Orchards Trail which, where possible, will take you away from the main roads and along public footpaths. The shorter trail is about 3 miles and includes the town centre orchards and nearby sites important for wildlife. The extended trail is almost 6 miles and takes in all the orchards plus part of the Wales Coast Path, offering spectacular views. 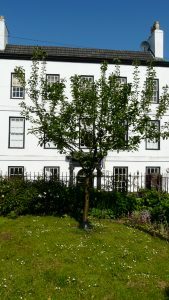 Ashmead’s Kernel (eating apple) in Hollins Close, Bridge Street. Both trails can be enjoyed all year round, with mostly hard surfaces and no stiles to climb! The uphill sections are done at the start of the trail, until reaching the Community Hospital, after which it is mostly level or downhill. In winter, the lack of leaf cover allows for much better views in places, but care will need to be taken when it is muddy at Penterry Park and along some of the Wales Coast Path. To follow either trail we recommend using the Trail Leaflet (available in English and Welsh) together with the Full Trail Directions and what to look out for, so that you get the most out of your walk. There is also more information about the Orchards, Trees and Wildlife along the way. All the documents can be downloaded and printed using the links. 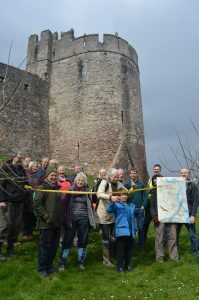 The trail has been designed by Transition Chepstow as part of the Welsh Perry & Cider Society’s ”Heritage of Orchards and Cider Making in Wales” project, funded by the Heritage Lottery. 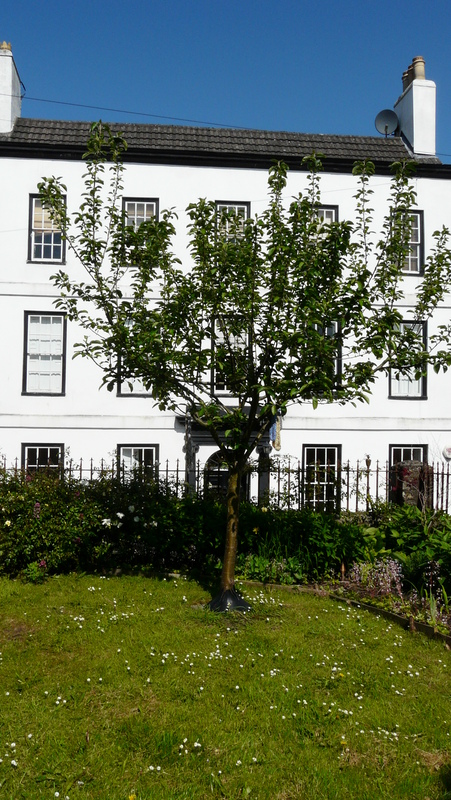 Please note that most of Chepstow’s community fruit trees are accessible for everyone. However, some fruit trees have been planted at public buildings, such as schools, where access is limited. The Orchards Trail features only those fruit trees which are accessible to all.